Ring Types: Most vintage mopeds have rectangular cross section rings, where both the top and bottom are flat. Most Asian two-stroke rings have a trapezoidal cross section, where the top slants downward as you go inward. Some vintage mopeds have a Dykes or “L” type upper ring, at the very top of the piston. ring size is the cylinder size that the ring would have a 0.004 to 0.008″ gap in. height is the thickness up-and-down. T & L rings have 2 heights, outer & inner. width is the depth inward-and-out. L rings have two widths, outer and inner. n.a. = none available Prices are for each ring, unless noted. Pinned or Not Pinned: Most moped piston rings are two-stroke style, where there are pins in the ring grooves of the piston that keep the rings from rotating around. Two stroke cylinders have holes or ports that the ring ends can snag on. So two stroke rings are pinned to the piston. Four stroke cylinders do not have any holes, so four stroke rings are not pinned. Knowing about those pins is important when installing. Getting the right rings: If your model is not in the applications, then you must measure the bore and the ring thickness. A calipers is the best tool to measure the bore (ring diameter) and ring thickness. Sometimes your rings might not be original, for many reasons. 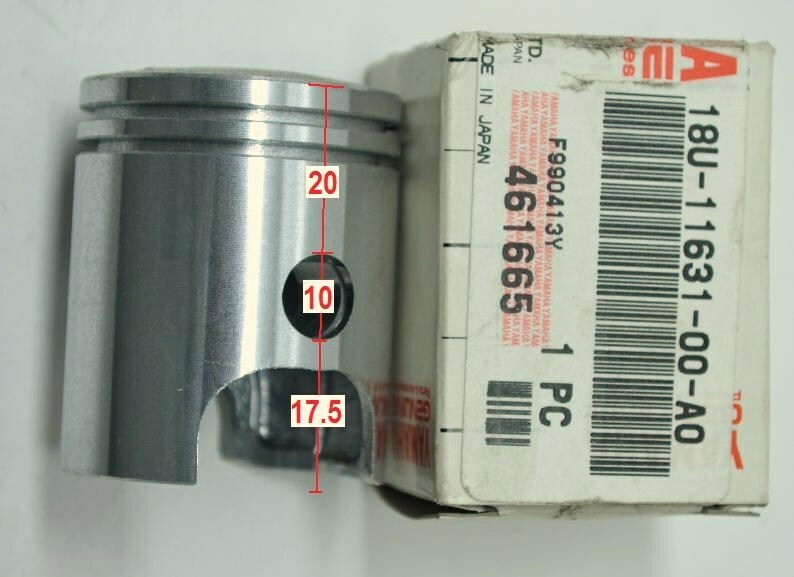 The piston might be aftermarket with thinner rings. The cylinder might be bored out to an oversize bore. Some mopeds came with more than one piston size or ring style. 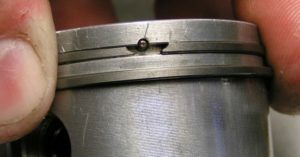 Break a ring, how not to: Two stroke pistons have little pins (stumps, bumps) in the piston ring grooves that prevent the rings from rotating. Knowing where each ring locating pin is, and aligning the ring gap over the pin during cylinder installation, is the key to not breaking the ring. Classifying rings: Rings get mixed up and are difficult to tell the size, unless a perfectly round cylinder of an appropriate size is available to place the ring in. If you try to squeeze a piston ring into a circle with just fingers, it inevitably becomes a very rounded polygon, or at best an ellipse. So the measurement becomes inaccurate. At right is how Myrons Mopeds’s Jawa piston rings were classified, using a piece of aluminum tubing with a tight fitting piston inside it to hold the tube round, and the test ring square. From top to bottom, 39.03 x 2.0, 39.28 x 2.0, 39.53 x 2.0, 39.78 x 2.0mm. Each ring increases in diameter by 0.25mm, so the circumference increases by Pi times that, or about 0.8mm. Here the inside of an old fishing pole tube is 39.78mm, perfect for the 3rd oversize 39.78 ring, on the bottom, with a gap of almost zero. Each gap is 0.8mm more because each ring is 0.25mm less diameter. It is important that the piston and ring fit the cylinder properly. Filing down: To make a ring slightly smaller, one of the two ring ends can be filed down, while preserving the shape. To reduce the size (diameter) by 0.20 mm, the end must be filed down by pi times that, 0.63 mm. When a filed down ring is installed in a cylinder smaller than it was designed for, two things change. The tension is greater, and the shape is slightly non-circular. So filed rings need a longer break-in period, to wear down the higher places. With 38 to 41 mm rings, the size can be reduced by 0.2mm with about 30 minutes of break-in, and by 0.5mm with about 2 hours of break-in. After break-in the rings have a mirror polish all around. Why is the width not specified? Because the inner side of the ring does not touch anything. The ring has spring tension pushing it outwards, keeping the bottom (inner) surface from touching the bottom of the ring groove. So the ring width can be any amount, from about half the groove depth, to the groove depth. The exact ring width is not important. Exact ring height and diameter are important. then upper size, then diameter. 23mm upper: 1970’s Casal, Zundapp? Install pistons with arrow towards exhaust, or else ring ends can snag on ports. 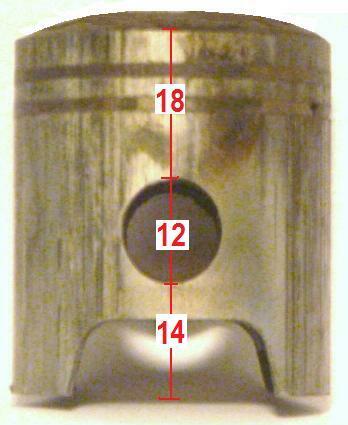 Piston actual diameter is measured at skirt (bottom), where it is largest. 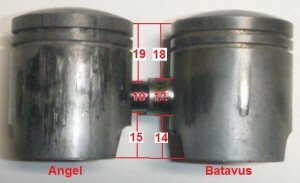 A Batavus piston (12 x 33 mm pin) can substitute for an Angel piston (10 x 33 pin), if the piston pin needle bearing is changed. The 10x14x13 needle bearing (with 2mm rollers) needs to be 12x14x13. But there are none that thin (1mm rollers). So a bronze bushing 12x14x13 must be used instead of a needle bearing, like one from a Puch. There are already oil holes in the Angel rod. Those holes need to extend through the bronze bushing to oil the pin. 8025090 38.00 12 17.0 23.0 37.95 Dykes 1.5FG Mahle n.a. Derbi std 1976-86 says “1003 E 119 A” ? ?????? 40.00 12 17.0 19.0 39.94 1.5-3F 1.5-3F Yamaha $40 Yamaha what? new, no rings, non avail. ?????? 40.25 12 17.0 19.0 40.22 1.5-3F 1.5-3F Yamaha $40 Yamaha what? new, no rings, non avail. 230102 38.20 12 22.0 17.0 38.1x 2.0FG 2.0FG Asso n.a. 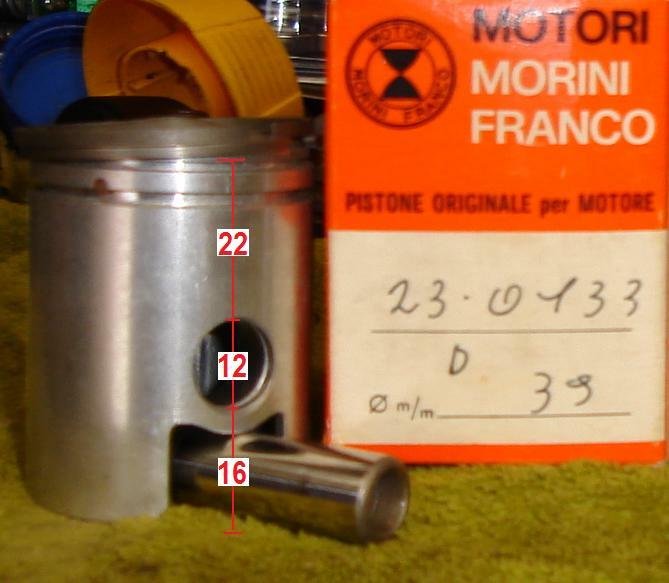 1os for Morini S5K2, can use Minarelli #4510? Bigbore 45.40 12 22.0 18.0 45.32 1.5FG 1.5FG Minn. $40 Minarelli original new in box, no rings, none avail. number mm mm mm mm specs specs maker Casal, Zundapp? It’s important that the piston fits the cylinder properly. An old messed up piston that fits correctly is better than a new piston that fits too loose or too tight. Too loose will be hard to start and weak. Too tight will seize up when hot. 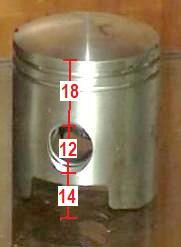 Often a cylinder needs to be bored out slightly to fit an oversize piston. Some aluminum cylinders have plated walls that cannot be bored out. 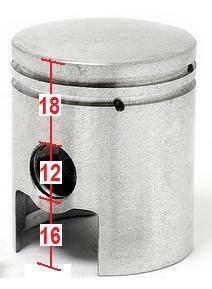 The piston diameter, measured at the skirt, is a hair smaller than the cylinder bore. As the engine gets hot, the piston to cylinder clearance approaches zero. 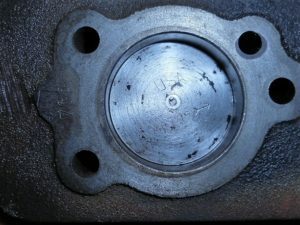 Besides “diam“, “upper“, “pin“, and “lower“, other things matter in piston compatibility. The ring pins must locate the ring gaps so they never pass over a port. The exhaust-side skirt must be long enough to cover the exhaust port at tdc. The intake-side skirt, on a piston port two stroke, controls the intake timing. Shorter skirt opens sooner and closes later. A longer intake skirt is one way some mopeds are restricted in power. 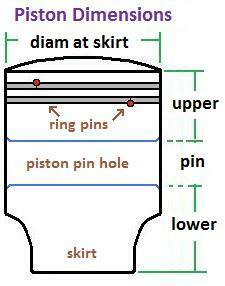 Simply grind the excessively long piston skirt back to 30mph specification, but no farther, to de-restrict the piston. Puch, Tomos, Garelli are the main kinds that use longer pistons to lower the speed, for 25 and 20mph states or jurisdictions. This list contains all pistons made by original equipment manufacturers, although most of them are no longer available. The not-available ones are listed for their information, such as speed versions or piston size choices. 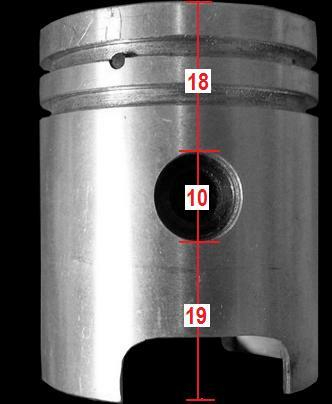 If you happen to have an unknown piston with or without a part number, you can identify what it is from this list by measuring it and looking for matching measurements. 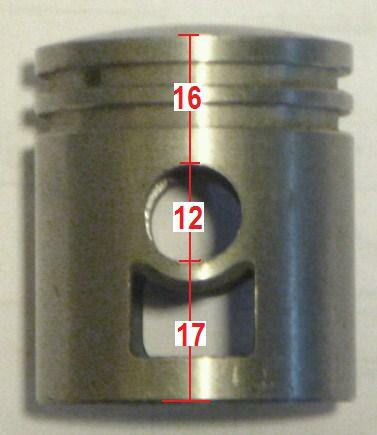 From all these specifications, perhaps a compatible piston can be found or adapted. Jawa pistons have 14mm piston pins, thicker than any other 50cc piston. There is not a good substitute for Jawa piston, not even one with a smaller pin. For a 12 pin, the upper distance of 18 would need to become 19. 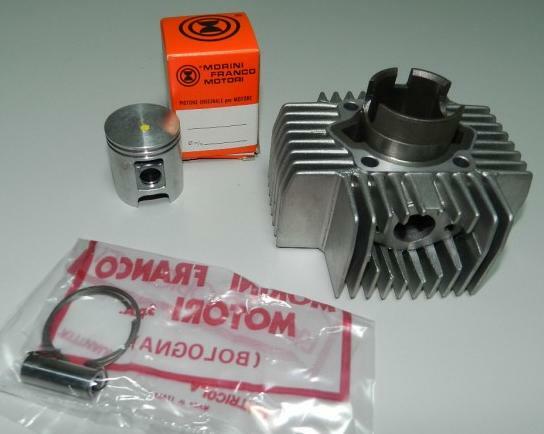 The only piston that Myrons knows of, available, with a 12 pin and 19 upper, is for a Honda NS50, but that piston has a big intake window for a reed valve. The window would have to be somehow blocked off. Kreidler pistons would substitute, but they are all 40mm and unavailable. For a 13 pin the upper distance of 18 would need to become 18.5. The only 13 pin piston is way too short at 15.5. Markings: The marking on top can tell the size. Decode the marking using the left caption. 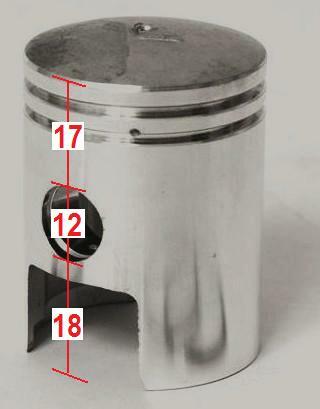 Then look up the size of the piston or cylinder using the right table. 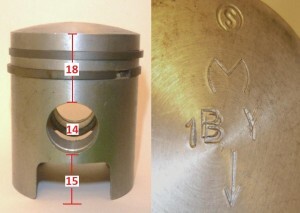 For example, this “1B Y” piston is supposed to measure 39.21 mm. 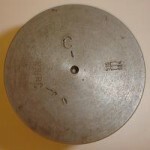 The measurement is “34,5mm from the base” which is just below the lower ring. Four pistons actually measured 39.21 there, and 39.23 at the skirt. 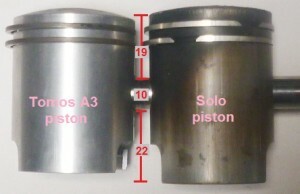 Other “1B” pistons were 39.20 and 39.22, 39.21 and 39.22, The rest were “B” (standard) 38.94 and 38.96, “2B” 39.44 and 39.46, “3B” 39.70 and 39.73, “4B” two at 39.95 and 39.97. Based on these eleven new pistons, all measured the same way at the same time, the Jawa piston sizes can be translated to standard piston sizes. The Jawa sizes (at the lower ring) are, on average, 0.02 mm less than standard sizes (at the skirt). 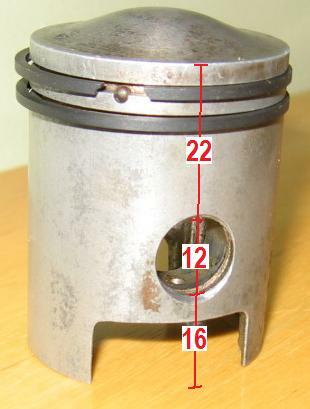 From the Puch service manual (at top of this page), the piston to cylinder clearance for a similar steel sleeved aluminum cylinder, is minimum 0.030, maximum 0.055. From the Jawa table of piston sizes (at right), it says the new piston-to-cylinder clearance is min 0.065, max 0.075 mm. 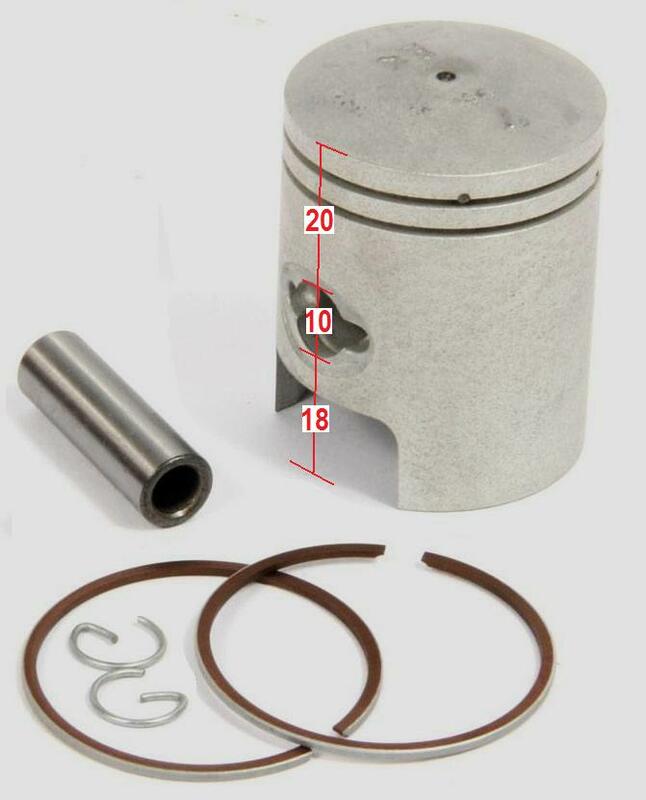 Piston Size Translator: When Jawa talks about piston size, their size is slightly less because pistons are slightly tapered. 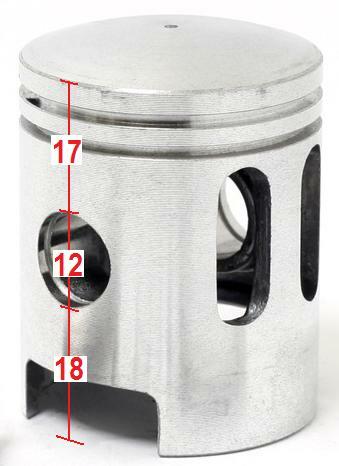 You have to add 0.02 mm to “Jawa” piston sizes to get “standard” piston sizes. Then the piston-to-cylinder clearance becomes 0.02 less, to min 0.045 max 0.055, more in agreement with Puch and most of the world. In inches it is 0.0017 to .0022 (one point seven thousandths to two point two thousandths). 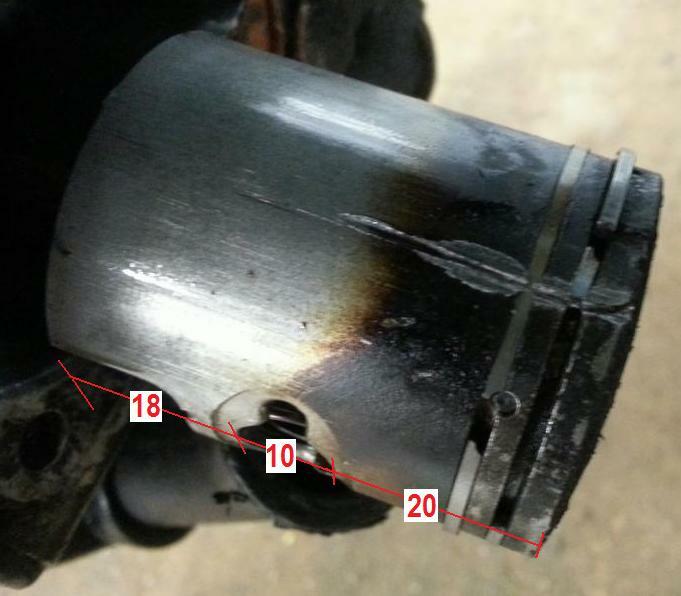 That clearance goes to near zero when the piston gets hot. 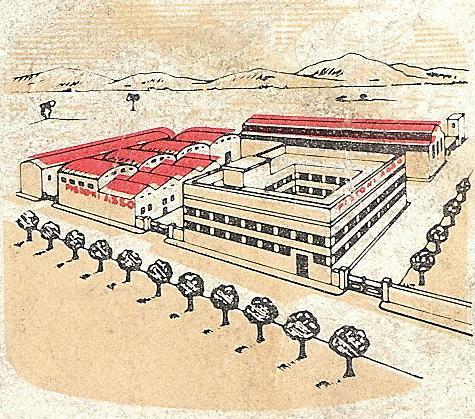 ASSO pistons were made in Italy mostly for Italian mopeds. ASSO stands for Assoluta Sicurezza Sempre Ovunque (Absolute Security Any time Anywhere). 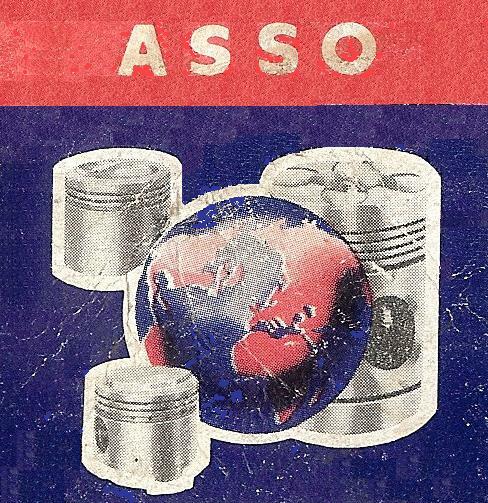 Early pistons said only “ASSO”, while later 1980’s ones said “ASSO.W”. Somehow ASSO merged with or was acquired by a German name, maybe some “kolben werke” to become ASSO Werke. Casal (made in Portugal) pistons are made in Germany by Mahle. They say “saida” on top, exhaust side, Portuguese for “outlet”. They have an unusual flat bottom. They have a total height of 50mm. Top edge to pin is 23mm, plus pin 12mm, plus pin to bottom edge 15mm. There are two bore choices 40 and 48mm, each with several 0.01mm (micro!) increments to get a precise fit. A cylinder of letter “F” should get a matching “F” piston, unless it is worn, then maybe a “G” or even an “H” would be best. If the piston fit is too loose the engine will be weak, noisy, and fussy. Too tight and it will seize and do damage. Piston rings are both size 40 x 2.0 FG gap style, like Garelli. 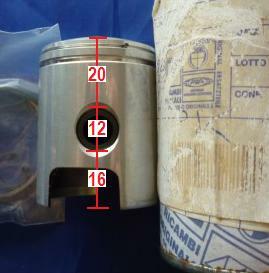 Garelli 4th oversize 40.8mm piston, made by Asso, says “40.8”. You can see it’s bigger. 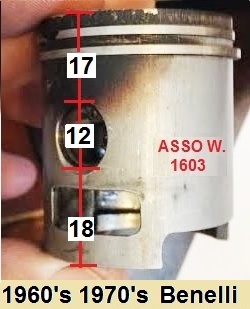 Middle, Garelli standard 40.0mm piston, made by Asso, says “40” and “S”. The “S” means scoria, Italian for exhaust. 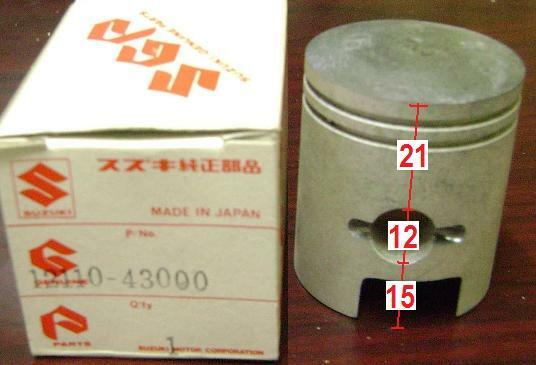 Right, Garelli standard 40.0mm piston, aftermarket. All three are oriented with the exhaust side down, like in the engine. Morini made a variety of 50cc engines. These pistons shown here are only for 1960’s to 80’s moped-type engines Morini MO, MO1, MO2, M1, MO2 foot shift, MO4, all 40.4mm. They also fit Verona, early Gyromat, and Benelli mopeds, originally 40.0mm, as an oversize. All of the rings and ring pin locations are the same. 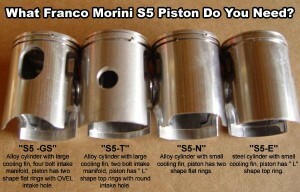 Other Morini pistons 38.0, 39.0, and 46.0 are listed but not shown here. Peugeot 103 pistons have slightly different sizes, aka “sorts”. Left of the red line are the “standard” 40.0mm sorts A to II (39.88-39.98). Right of the red line are the “oversize” 40.5mm sorts K to Q (40.45-40.50). Upper half are chrome bore cylinders, pre-1979 with single letter sorts A to Q. Lower half are nikasil bore cylinders, 1979-on with double letter sorts AA to II. 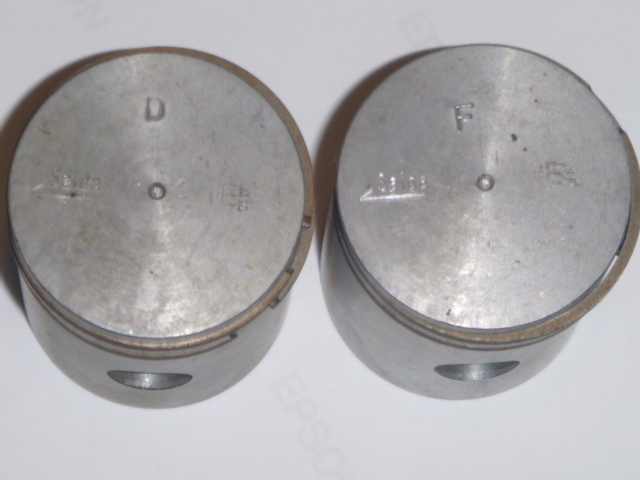 Peugeot 103 moped pistons are a very old design that has been in use at least since the 1950’s. The rings are thick, 2.5mm, like most old rings were. Peugeot 103 cylinders are all aluminum with a chrome plated (pre-1979) or nikasil plated (1979-on) cylinder wall. They expand along with the aluminum piston as they get hotter. Unlike a steel sleeve cylinder that fits slightly loose, when cold, and wiggles a tiny bit, these should be a light sliding fit, where the piston, without rings, pushes through by hand but does not fall through by it’s own weight. When the piston fit is too loose, it makes a tinkle sound when idling, and produces less torque. When it’s too tight, it simply won’t move easy, or at all, and when hot it will smear (melt off) the hot exhaust side and stick (seize). 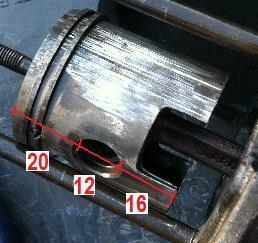 The procedure for “fitting” a Peugeot piston requires a flat stone cylinder hone (not a ball hone) for first making the cylinder wall flat by removing any high spots, and a Dremmel high speed rotary cutting tool for removing burrs from the edges of the ports, and a small round file for removing burrs and high spots from the piston, especially around the wrist pin holes. Sometimes just the act of pushing the wrist pin in and out will raise the corner edge and make the piston fit tighter. 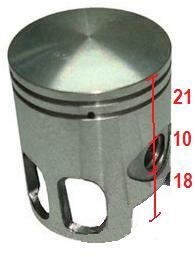 The bare piston is pushed into the cylinder in different ways. The high spots are located, by feel and sometimes vision, and removed. When all high spots are removed, and the piston still does not fall through under it’s own weight, then the fit is perfect. Worn cylinders need slightly bigger pistons. 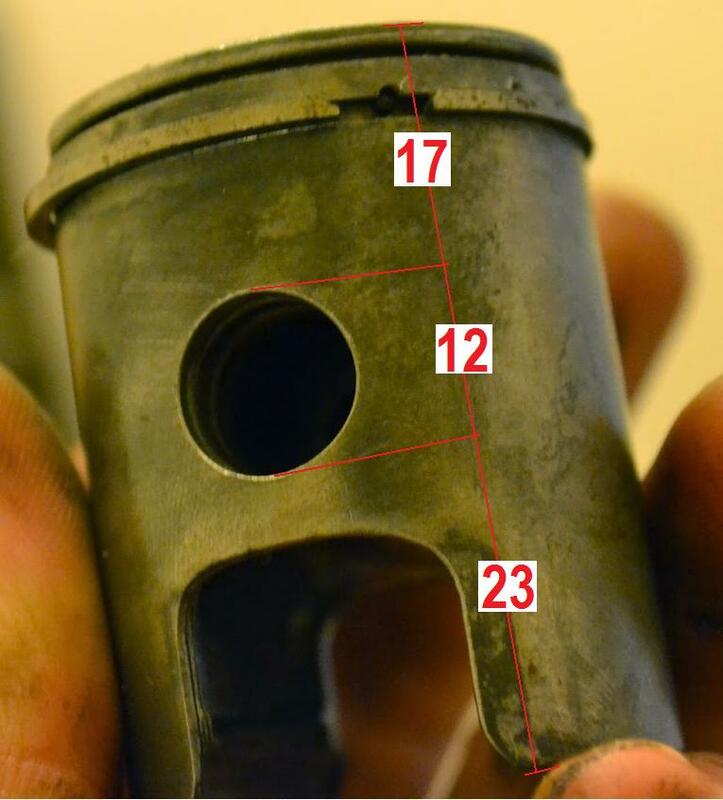 So a worn “C” cylinder might need a D, E, or F piston. 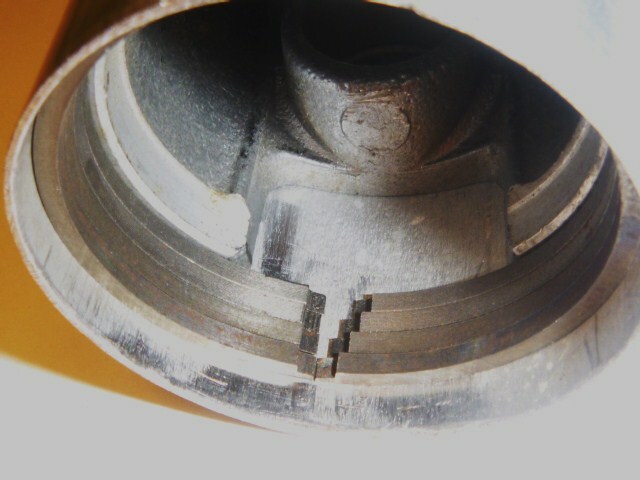 Badly worn or “gouged” cylinders need to be replaced (unless the gouges are lower than the exhaust port). Peugeot has made plenty of “oversize” (40.5mm instead of 40.0mm) pistons. But there are no 40.5 cylinders in California, only 40.0mm. 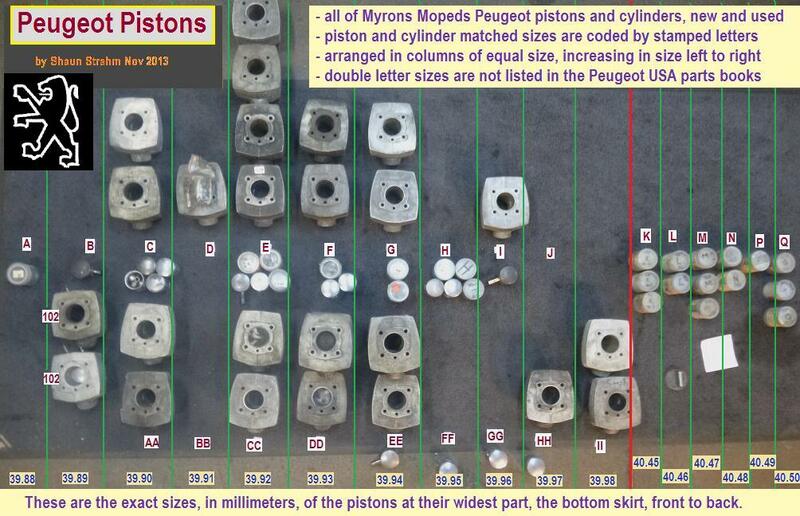 That’s why Myrons Mopeds has 40.5 pistons but no cylinders. Too bad it’s expensive to bore out and re-plate a nikasil cylinder. It is an option, made possible by the half millimeter bigger pistons available. 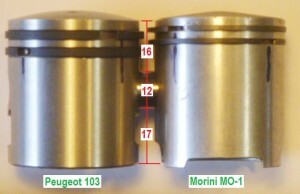 Piaggio made their own pistons. 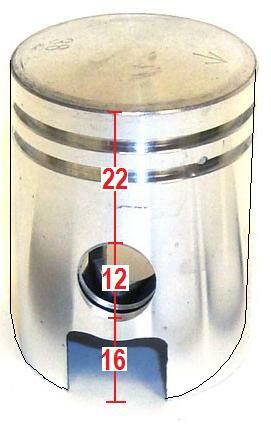 All original pistons say Piaggio or have the logo on the inner side. They all have an arrow on top with the letters “SC”. That means “scoria”, Italian for “exhaust”. During installation, the arrow points toward the exhaust. 10 or 12mm piston pins: All of the Vespa moped pistons below have 12mm wrist pins. There are some (as yet unknown) non-US models, probably Vespa clones, with 10mm wrist pins. 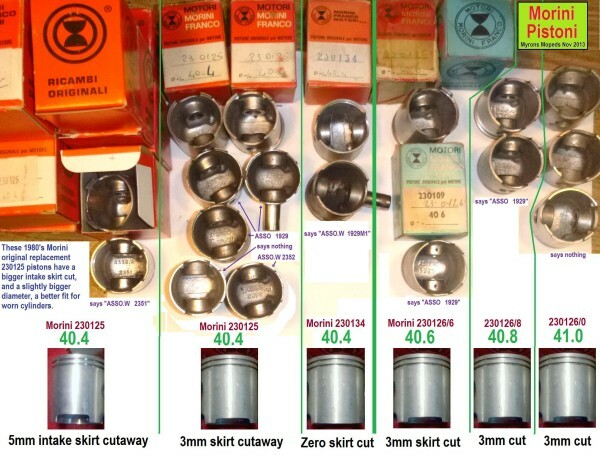 Piston versions: By having all of the Piaggio Parts Manuals, and especially the Parts Amendments 1, 2, 3 etc, it was possible to extract all of the Vespa (Piaggio) moped piston and ring part numbers. The millimeter sizes are not in any parts manual. They are from service manuals and actual parts new and used. You are currently browsing the archives for the Pistons category.